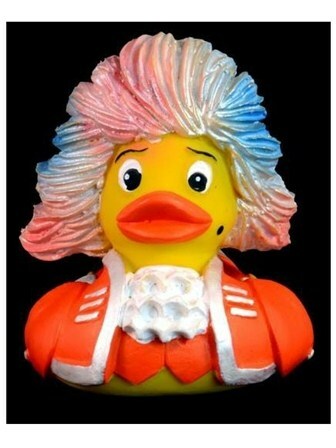 After the whirlwind success of the original Mozart Rubber Duck comes the Rock Meets Amadeus Duck in Orange. Sure to be the highlight of your bath! After the whirlwind success of the original Mozart Rubber Duck comes the Rock Meets Amadeus Duck in Orange. Sure to be the highlight of your bath and a real talking point! Like all of our rubber ducks, this one is made from natural rubber and hand-painted with natural dyes, meaning they are all unique and totally safe!